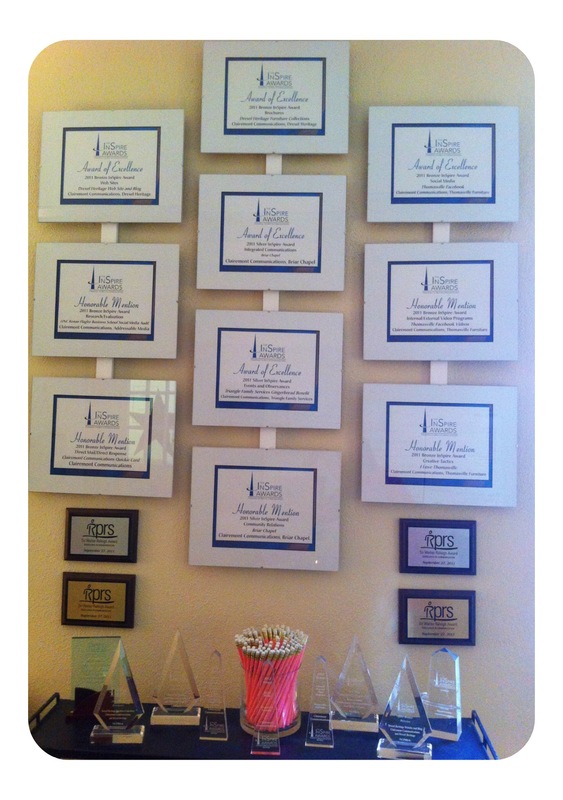 Some of Clairemont’s awards displayed in the office. 1. Compile publicity articles and material into a book that you can show to prospects, clients or investors. A publicity book or press book provides an easy way for these audiences to see who you are, what you do and what you are capable of doing. Showing that your company is newsworthy and credible will help reinforce why your company is desirable to work with compared to your competitors. 2. Many publications present awards in various categories. If you have won publication awards, feature them on your website, social media and advertisements. If you do not have any of these awards, you should work for them! Publication awards establish superiority over your competitors and third-party credibility for your work. 3. Promote articles written about your products in your advertisements. This makes your ads more credible. In advertising your company and products, referencing previous publicity (i.e., “As seen in Southern Living Magazine…”) you are referencing good things that others have said about you, which can help establish credibility with consumers. 4. Send articles to industry opinion leaders. Consumers value what opinion leaders say or think about a product or company. Many view them as “in the know” regarding their field of expertise. Sending opinion leaders articles about your company and its products forges a positive relationship with them, meaning you are more likely to get their free word-of-the-mouth promotion. 5. Include your published articles on your website and share through social media. Articles serve as valuable content for your website and your social media channels. Make sure the articles are easy to access. Give article summaries so visitors can quickly get the message without having to read the entire document. 6. Use your articles to get more publicity. Carefully! Sharing one outlet’s story of your company with another news outlet can be risky. It can cause the second editor to say that the story has already been done. However, done in the right way, existing coverage can reinforce your newsworthy-status and potentially help the editor think to see the value of another story idea about your company. Perhaps more effective than directly sharing coverage with other news contacts is building a strong base of media coverage that can easily be found online for reporters who might decide to research your company in consideration of covering it. We often see this to be the case with our clients who are growing into having a regional or national story. When we pitch that higher-tiered media contact, chances are, he/she will Google our client. We want the results to show steady local and perhaps trade coverage. What are the ways you merchandise your news coverage? For more ideas, leave your email address and we will send you our complete list. Hi, Frank! Appreciate your comments! Wanted to point out that we’ve made some revisions to the post — felt like we needed to especially call out that #6 is best handled with extra care. Definitely want to use coverage as a stepping stone as you say, and in a way that doesn’t ruffle feathers! Hi Margot, I’m a big fan of #3 and #6. Many PR pros don’t think of advertising content, but it’s a great strategy: paid media for earned media purposes. This also works on LinkedIn and Facebook. #6 is a classic, using one publication as stepping stone!